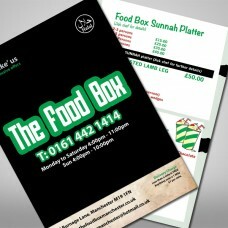 We print High quality menus, perfect for takeaways, restaurants, coffee shops, bars and more. Printed in a variety of sizes from A5, A4, A3 and can be folded once or twice. Final Print UK can print large quantities of menu printing so your business can reach a large audience. Supply your own artwork or use our in-house design team to create a wonderful design for you. Please allow 7-10 days for menu printing.